VMware Virtual SAN Fundamentals [V 5.5] is available to customers free of charge. * Introduce concepts related to the architecture and features of VMware virtualized storage. * Understand the primary use cases and customer situations when Virtual SAN is best used, including high level technical qualification criteria. * Enlist the prerequisites needed to configure Virtual SAN. 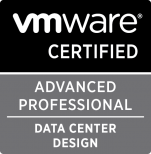 This training would be valuable for any engineers, salespeople or anyone else who wants a solid foundation for understanding VMware VSAN. Earlier this month, I received notification from Corey Romero and the VMware Social Media Team that I have been selected as a vExpert for 2014. I am honored to be included among the 754 vExperts that were announced here. Congratulations to everyone who was selected, particularly my fellow ENS, Inc. employee Jason Kaplan-Coleman! I am looking forward to being engaged within the vExpert and wider VMware community and see this as further motivation to take my participation to a higher level.